iDirect Evolution X3 service for Africa. This is Satsig.net web site. 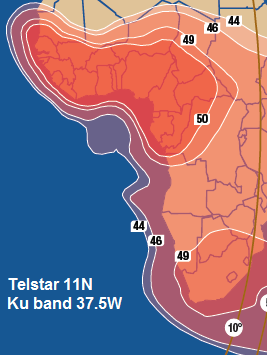 Connect Internet provide an iDirect Evolution X3 service to Africa using the Telstar 11N satellite at 37.4 west orbit position. This provides for Ku band operation in the African countries included in the coverage shown by the beam map. ConnectX3 is a 2-way VSAT system using iDirect EVOLUTION X3 for unlimited broadband Internet. It is low-cost 2-way broadband Internet solution in Africa via Telstar 11N satellite. NOW fully launched to provide unlimited 2-way broadband Internet in East, Central & West Africa. The Connect Internet iDirect hub is located at the Onlime teleport. This page is for information only. Please contact Connect Internet for further details. This is not a paid for advertisement.